“All Is Not For All” is the highly anticipated New Album from the U.A.E. 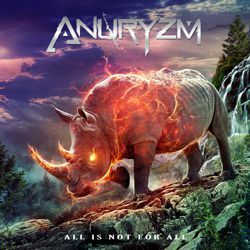 prog metal band “Anuryzm” which is set for release on June 15, 2015 via Melodic Revolution Records. According to the band: “Depolarized” is track 4 from the upcoming album “All Is Not For All” and is about the world shifting polarities and the cataclysmic results of such developments. This can also be easily reduced to relate to the human condition. “Depolarized” has been released as a Digital Single and is available via iTunes, Amazon, CD Baby, Tidal, Bandcamp, Xbox Music and more. Mineral, Full Agonist, Humanoid, Depolarized, The Challenger, Oceans Apart, All Is Not for All, 199x, Impermanence, Perispirit. Musician on the album: John Bakhos (Guitars & Synths) Nadeem Bibby (Vocals), Miltiadis Kyvernitis (Additional Backing Vocals) Michael LePond (Bass) Charley Zeleny (Drums), Uri Dijk (Synths), Christopher Chaplin (Orchestral Strings on Oceans Apart). Jan has designed albums for Manowar, Apocalyptica, Korpiklaani, Legion of the Damned, Maelstrom, Sirenia, Stratovarius and many other artists!